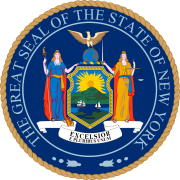 This is a list of special elections held in the congressional districts in the State of New York to fill vacancies which were caused either by the resignation or death of representatives-elect before their term began, or by the resignation or death of the incumbent representatives. ^ At this time, in the 2nd and the 3rd District 2 congressmen were elected on a general ticket. ^ Tompkins had been elected in April, and resigned in July 1804. This time the special election was held before the congressional term began, thus Mumford held office during the entire legal term. ^ Mitchill had been re-elected in April, and resigned in November 1804. A special election was held in December 1804 or January 1805 to fill both vacancies, the remainder of Mitchill's term in the 8th Congress and the full term in the 9th Congress. Clinton took the seat in the 8th Congress, and held office during the entire legal term of the 9th Congress. This page was last edited on 23 March 2019, at 01:05 (UTC).